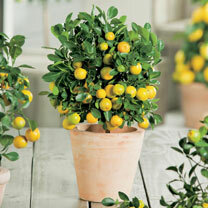 Lovely windowsill citrus Calamondin. Includes a trellis for a wonderful scented live gift. The striking bitter orange fruit and fragrant flowers last for weeks and this tree will continue to fruit and flower on and off all year round. Use the fruits orange or green in drinks and cooking. 14cm pot, 30cm high.